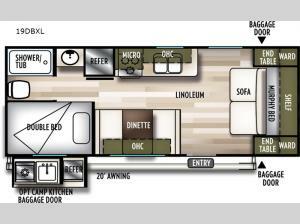 You will love the versatility that this Wildwood X-Lite model 19DBXL offers with a Murphy bed setup. You will have plenty of space and seating during the daytime hours between the sofa and booth dinette, even without any slide outs. Once it gets dark, and you are ready for bed, just drop down the Murphy bed and voila, a comfortable sleeping spot for the night! There is also a double bed in the back next to the private tub/shower and toilet. 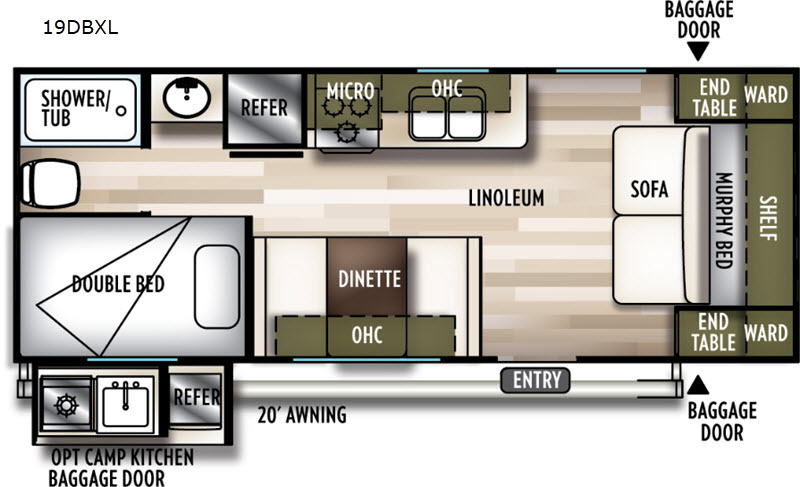 The dinette can even be transformed into sleeping for a little one or two if you need the extra room. You will find complete kitchen amenities indoors and also have the ability to cook outdoors using the standard camp kitchen which is great on beautiful days, and even with a light rain the 20' awning gives you protection from the elements and allows you to cook and hang outside the trailer if you like.